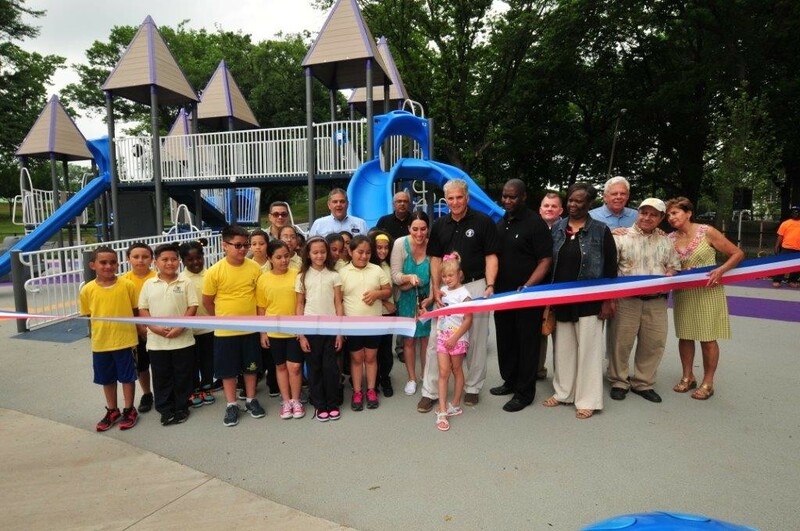 Newark, NJ – On Friday, June 23rd, Essex County Executive Joseph N. DiVincenzo, Jr. announced the completion of a project to modernize the Shakil Williams Playground in Essex County Branch Brook Park with new apparatus and a rubberized safety surface. The improvements are part of the County Executive’s ongoing initiative to provide the most up-to-date recreation facilities to meet the needs of the community. “I am very excited about how our new playgrounds, including Branch Brook Park, are incorporating features of the surrounding community in their design. It connects our parks with the people who come to enjoy them, helps bring the history of our parks and neighborhoods to life, and creates unique places for your children to play,” DiVincenzo said. “It is important to modernize our recreation facilities and playgrounds because these are the places our children exercise and learn socialization skills,” he added. “I want to thank Joe DiVincenzo. He promised us something special and look what we have now. My son surely is smiling down on us today,” said Shakil Williams’ father Kevin Brown. “This is a wonderful job and gives our children a wonderful quality of life,” he added. “I appreciate a leader like our County Executive who recognizes the need to keep our open spaces vibrant,” NJ State Senator and Deputy Chief of Staff Teresa Ruiz said. “This is a great tribute to Shakil Williams, and if we keep his spirit in our soul we all will be in a special place,” she added. The new playground is designed with a music theme, has musical instruments incorporated into the apparatus and has a small amphitheater for performances. There is a variety of play equipment that is age-appropriate for children in the 2- to 5-year-old age group and 5- to 12-year-old age group and a rubberized safety surface, which is a common feature in all playgrounds in the Essex County Parks System. The old playground had separate areas for the two age groups with a natural grass path dividing them. The new design combines the play areas into one 12,000-square-foot facility and eliminates the natural turf path which was always worn and muddy because of the amount of children who came to play. In addition, the playground has been moved closer to an existing open air pavilion. Other upgrades include a paved pathway connecting the playground to the open air pavilion and other walking paths in the Southern Division of Branch Brook Park, tree trimming, landscaping, benches and trash receptacles. There is a fence around the playground to prevent children from running off. The playground was dedicated in honor of the late Shakil Williams in 2006. An avid fisherman, the 12-year-old Williams was a regular participant in Essex County’s annual fishing derbies and was an 11-time derby champion before he passed away in 2005. An archway with Williams’ name and the bronze plaque from the 2006 dedication ceremony are located at the playground’s entrance. Suburban Consulting from Flanders received a $49,950 contract to design the new playground. Tec-Con Contractors from East Orange was awarded a publicly-bid contract for $1,055,740 to perform the construction work. The Department of Public Works monitored the project and answer questions so delays were avoided. Funding for the playground was provided through the Essex County Capital Budget and a grant from the Essex County Recreation and Open Space Trust Fund. Construction of the playground started earlier in March and was completed in four months. The Branch Brook Park Alliance has been the primary partner with Essex County to revitalize Branch Brook Park, which opened in 1895. The Alliance is a public/private partnership organized in 1999 to provide design expertise and funding support to help Essex County restore and revitalize the park. More than $50 million of upgrades have been made throughout the Park through this partnership. Park enhancements have been supported with grants from corporations, the New Jersey Green Acres program, the Essex County Recreation and Open Space Trust Fund, philanthropic organizations and community members. In addition, the Alliance has sponsored a variety of programs to clean the waterways, spruce up the park, maintain the cherry tree collection, develop an urban farm, among other activities. A playground designed with a cherry blossom theme was opened at the Essex County Cherry Blossom Welcome Center in 2015. The Barbara Bell Coleman Welcome Center and Concourse Hill upgrades, along with the opening of a two-mile, synthetic surface walking track, creation of a children’s garden at the Cherry Blossom Welcome Center, renovation of a well in the Park’s Northern Division, the rehabilitation of the Reservoir Walls in the Park’s Southern Division and modernization of the Clifton Avenue basketball courts were completed in 2014. The bronze statue honor the late tennis legend Althea Gibson was dedicated and the 20-court tennis complex named in her honor received a complete makeover in March 2012 and the field house in the tennis complex was renovated in July 2012. A multi-phase project to upgrade the lakefront in the Southern Division was completed in April 2012. It included the restoration of the historic Prudential Lions statues and balustrade, the rehabilitation of two buildings for restrooms and public meeting space, updating the music court with new pavers and landscaping. The music court overlooking the lake was dedicated as the “Prudential Concert Grove” to recognize the corporation’s ongoing support to restore the Park, and a memorial cherry tree grove was rededicated in honor of Kiyofumi Sakaguchi, who was President and CEO of Prudential International Insurance at the time of his death. The renovation of the historic Octagon Fieldhouse in the Essex County Stephen N. Adubato, Sr. Sports Complex was completed in April 2011. Completed in 2010 were a project to pave the park roadway, upgrade walking paths, and install historic lighting in the section of the park from the Cherry Blossom Welcome Center to Heller Parkway, the planting of 600 Cherry Trees and other trees throughout Branch Brook Park and the paving of the park roadway from Mill Street to Washington Street. In September 2009, the Middle Division Recreation Complex was renamed as the “Essex County Stephen N. Adubato, Sr. Sports Complex,” in honor of the founder of The North Ward Center and Robert Treat Academy. In August 2009, a synthetic surface football/soccer field was constructed and named after NFL Hall of Famer and Barringer High School alumni Andre Tippett. Earlier in 2009, a “demonstration project” in the Branch Brook Park Extension enhanced landscaping, added Cherry Trees, improved pathways and modernized entranceways into the park from Franklin Avenue. The Bloomfield Avenue Bridge that passes over the Middle Division was rehabilitated in 2009. The Cherry Blossom Welcome Center was renovated and transformed into a year-round showplace to raise awareness about the Japanese Flowering Cherry Blossom Trees in 2008. A replica of the historic Octagon Shelter in the Southern Division of Essex County Branch Brook Park was built in 2007 and the baseball field complex known as the “three diamonds” was upgraded in 2007. The baseball/softball complex in the Branch Brook Park Middle Division was reopened in April 2005 after a remediation and modernization project, and the historic restoration of the Park Avenue Bridge was completed in 2005. Entrance enhancements, new fencing and landscaping along Clifton Avenue and Mill Street, and a major improvement project along Lake Street have made the park more inviting. The Essex County Park System was created in 1895 and is the first county park system established in the United States. The Park System consists of more than 6,000 acres and has 23 parks, five reservations, an environmental center, a zoo, Treetop Adventure Course, ice skating rink, roller skating rink, three public golf courses, a miniature golf course, golf driving range, three off-leash dog facilities, a castle and the Presby Memorial Iris Gardens. Branch Brook Park was created in 1895 and is the first park in Essex County’s system. At 359.72 acres, it is the largest county park in Essex.